I knew that I had to see “The Plains Indians: Artists of Earth and Sky.” And I knew that I had to take Lauren Chief Elk with me. The Plains Indians show took a long road to New York: art lovingly created over centuries in the heartland of America (often before the existence of the United States.) These pieces traveled through the hands of many: into institutions and private collections in France, Germany, Austria, Switzerland, Canada, and the United States. The exhibition originated at the Musée du quay Branly, Paris, was curated by Gaylord Torrance of The Nelson-Atkins Museum of Art, and was organized by Judith Ostrowitz, Ph.D. at the Metropolitan Museum. I was beyond excited to see a culture that is often parodied and misunderstood, but rarely respected, in the halls of the Met. And my clique had to come too! Art can be an individual or communal experience, but I wanted to hear from a modern Plains Indian. Lauren Chief Elk, a Nakoda/Lakota writer, activist, and data artist, was just the voice. Both tribes are part of the Oceti Sakowin (or Sioux) Nation. 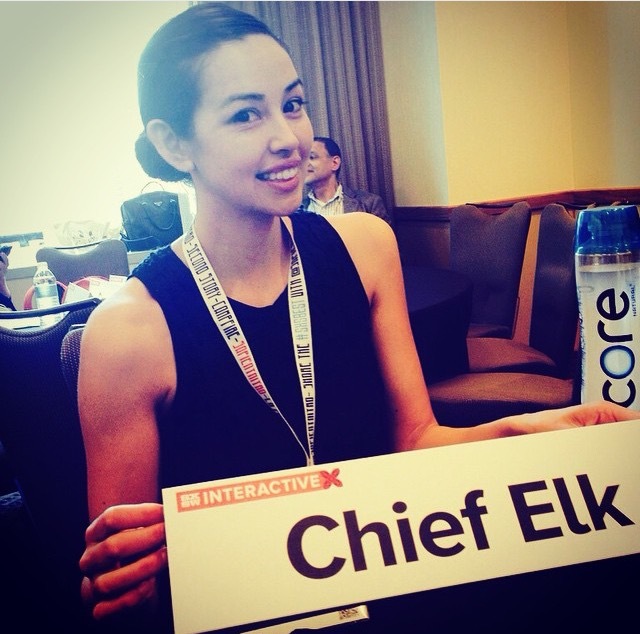 Chief Elk is a true digital native, indigenous to both the Internet and the Americas. She ties together these identities in a way unique to our generation. Chief Elk uses technology tools to continue conversations about tribal sovereignty and women’s rights. Her fierce tweeting and incisive data collection describe the struggles of her community. You may not agree with everything she says, but you can’t deny that she’s one of the most passionate voices online today. I’m proud to welcome Lauren Chief Elk as the inaugural Color Critic. You can learn more about her work on the Save Wįyąbi Project and Model View Culture. We’ll be tweeting about this episode using the hashtag #digitalnatives. Tiffany Bradley works at the intersection of contemporary art, social justice, and Millennial culture. She has over a decade of experience in marketing for cultural institutions and independent businesses. Tiffany has worked in audience development at Race Forward, Americans for the Arts, Fractured Atlas, and Heart of Brooklyn. As a Fulbright scholar, she focused on contemporary art spaces in the Middle East. © 2015 Shamsiya Group, Inc. All rights reserved.